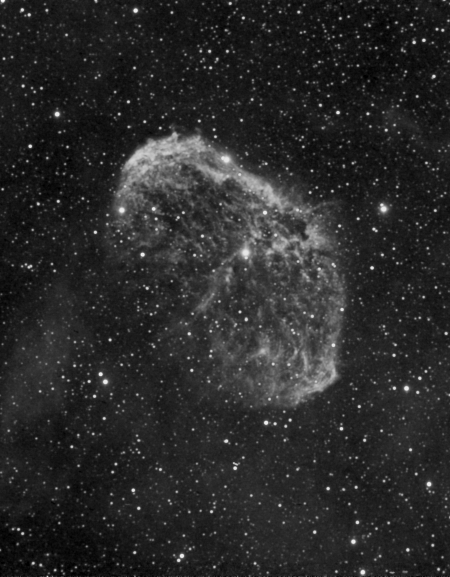 In order to get a feel for how long an exposure is actually useful, I’ve been capturing more Ha data for NGC 6888. The following image is composed of 71 10-minutes subs. The majority of the difference in appearance between this image and the one previous post can be attributed to a slight tweak to the image’s gamma. When they are displayed with the same settings, there is a very slight decrease in the noise apparent in the darker areas of the newer image, at least I think there is. I’m not certain I could tell the difference if I did not know which was which. Here is the previous image with the same (approximately) gamma tweak. 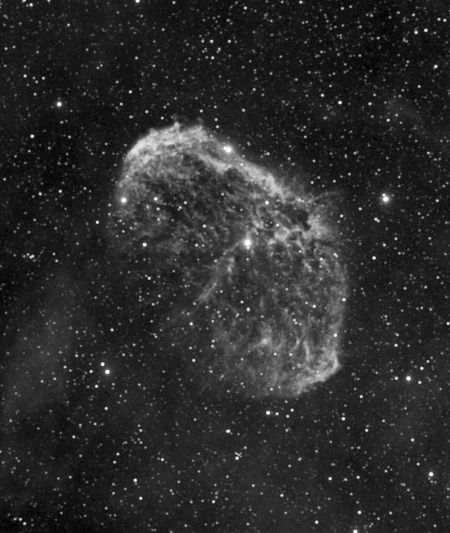 This entry was posted on Saturday, July 26th, 2008 at 3:44 pm	and is filed under Amateur Astronomy. You can follow any responses to this entry through the RSS 2.0 feed. Both comments and pings are currently closed.